The versatility, strength, and speed of 3M’s Scotchbond Universal Adhesive combine to make it a truly universal adhesive. It can be used in all application techniques, including total-etch, self-etch, and selective-etch. Its simple technique can be completed in 35 seconds. I was an early adopter when this product came out in 2012, and have been using it ever since. It is very easy to use, and has become my go-to adhesive. Using this product has given the patients less sensitivity after a filling. I highly recommend this product. the product works well on root canaled teeth, however, when placed on vital teeth there is a tendancy for sensitivity on greated than 50% of the time. Great product for all types of procedures. I love the color and viscosity, does not evaporate quickly and its easy to see. We have been using SE bond for posterior teeth for over a decade with great result, but we still had a separate bonding agents for anterior teeth with a total etch technique. In addition, we found the 2 bottle systems to be very wasteful and more expensive. Scotchbond Universal gives us everything we need in providing non sensitive posterior restorations and, with a total etch, contributing to esthetic anterior restorations. In pediatrics this makes for a faster, more streamlined procedure. Our doctors have been very pleased and we do not need multiple bonding systems. I have been using the product for about 3-4-months. Very simple to use. Fits well into our existing systems. Not one case of post op sensitivity! 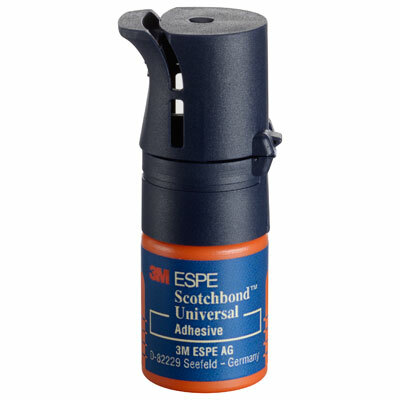 I found the Scotchbond Universal Adhesive by 3M efficient and easy to use. It eliminates acid etching & rinsing but more importantly, eliminates post-op sensitivity from acid etching. The applicator is packaged with the universal adhesive combining the etch, primer & adhesive application into one simple efficient step-an amazing product! Product is packaged and dispensed from a novel and well- thought-out container. Only reqires the use of one hand, and waste is minimized. Exhibits good bond strength and is kind to oral tissues. Post-operative sensitivity has been minimal. Pricing is competitive.